In April 1999, Vladimir Voloshin and Evgeny Momot established a small publishing company, named "Mineral Resources of Kazakhstan”, which was publishing the magazine under the same name among its first projects and upon request of the Ministry of Geology of the RoK until the spring of 2001. The experience in communications with the international business representatives, obtain during the period of the magazine publication had shown that they need the relevant and verified information about Kazakhstan in the area of economy, business and investments. Therefore, in May 2000, the Company decided to launch its own publishing project, shaping its development for the next few years. Invest Kazakhstan International Business Magazine was established in partnership with the Kazakhstan Investment Promotion Centre Kazinvest. Planned as a "platform" for an open dialogue between the Government of our country and the foreign investors, it served as a testing ground, where the best publishing technologies and know-how were tested by the Company, which was re-named as Kazakhstanika in the autumn of 2001. The Magazine’s advertisers became its first clients for the corporate image printing business products, and the Company gradually transformed to a fully-fledged Kazakhstanika Publishing House in 2004. It was a time of changes- the business in our country was rapidly developing, and the same was happening with the Magazine. At that time, it became clear that the Magazine shall extend its coverage as a specialized publications for the foreign investors. Therefore, in May 2005, exactly five years after publishing the first issue, InvestKazakhstan was renamed as Kazakhstan business magazine. Meanwhile, its mission has evolved into support to the leaders of Kazakhstan’s business in establishing their business connections and reaching new levels of development. In 2007, investkz.com was launch for providing the information to the investors, which significantly expanded the magazine potential as an informational source for the domestic and international business. The electronic version of the Magazine’s materials made up the main content of this web-resource, which is popular in the business community. The period of 2008-2009 was hard for the Kazakhstani entrepreneurs, since they struggled with the consequences of the global economic crisis. The down trend in business activity had a negative impact on the media market and many business publications were closed, or they were forced to reduce their circulations or frequency. Kazakhstanika decided to chose another way, launching the accelerated growth strategy in all directions. In 2008, the number of magazine per year increased from four to six, and in 2009, the circulation reached 3000 from the previous 2000 copies. In 2010 the Company reached a significant milestone, when the Magazine project was allocated as a separate legal entity – Kazakhstan Business Magazine LLP, headed by Sergey Gakhov, Managing Editor of the publication. The staff was increased and they were placed in a separate office. In order to satisfy the needs of our readers at highest level and to strengthen the effective relations with the advertisers, we segmented the published issues on key topics. As a result, now there are six special editions of Kazakhstan Magazine: "Made in Kazakhstan", "Investors", "Mining&Metals", "Infrastructure", "Oilguide" and "Leaders", which are published on the annual basis. In 2012, it was decided to increase the circulation, which amounts to 5000 copies now. 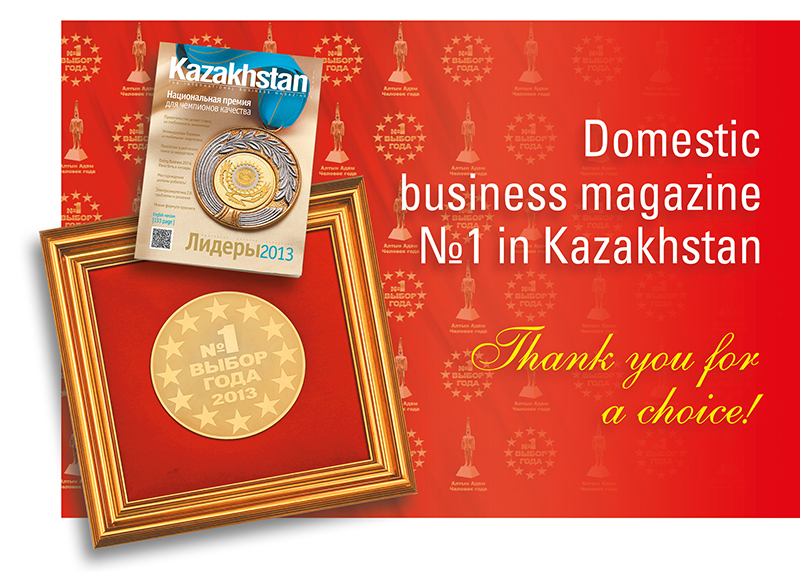 The continuous expansion strategy was successful, since in July 2013, Kazakhstan Magazine received a star in the nomination "The Most Reliable Business Partner” at III International Festival Mass Media Star Awards, and in November it won the Festival Choice of the Year in the nomination of the Best Local Business Magazine in Kazakhstan in 2013. Today Kazakhstan Business Magazine LLP is a young and dynamically developing company, which is not limited to publication of one of the most respectable business publications in our country, but it also develops the new business directions.